Synopsis: In Fiddlers Three, the Three Stooges are Old King Cole’s fiddlers, who come to the rescue when the King’s daughter is kidnapped by the evil magician Murgittroyd. Fiddlers Three begins with the Three Stooges (Moe Howard, Larry Fine, Shemp Howard) as the titular Fiddlers Three for Old King Cole (played by Stooges regular Vernon Dent), who begin the short with fiddling and slapstick dancing, as well as humorously acting out three of Mother Goose’s Fairy tales — Shemp jumping over the candlestick as Jack be nimble, Larry (in drag) as Little Miss Muffet, and Moe as Simple Simon (with Shemp as the suffering pie man). Things turn sour quickly when the Princess is kidnapped, and it’s the Stooges to the rescue! Just as soon as they shoe their mule, Sue. He proceeds to make a beautiful assistant appear in a large box, only to have her disappear (via a trap door leading down to the basement) and plans to have the Princess exchange places with her. Thanks to the Three Stooges’ interference, however, the Princess is freed, and the Stooges are captured by the guards … until the assistant walks by, distracting all of the guards who follow after the beautiful young lady — leaving the Three Stooges unguarded, and free to climb up the rope ladder to the “magic” box. Murgittroyd proceeds to “saw the lady in half” as well as “piercing” the box with swords — leaving the Three Stooges slapstick opportunity as they deal with the swords and the saw blade. Eventually, they can’t take any more, and burst out of the box, as the rescued Princess returns and implicates the evil Murgittroyd. The Three Stooges begin dispensing justice (spanking the fake magician with the flat of their swords) when the beautiful assistant walks by, causing all of the males (except Shempeth) to follow her off stage, and giving Shempeth room to do an old comedy bit of drinking water after having been stabbed by the swords. Title card: Coleslaw-vania – a small kingdom in ye old country where ye men are men, and ye women are glad of it. Moeth (Moe Howard): Our girlfriends threaten to give us the gate unless we marry them soon. King Cole (Vernon Dent): Notify the FBI! King Cole (Vernon Dent): Yes, Flannagan, Brannagan and Iskovich – detectives. Moeth (Moe Howard): Our steed is not shod. Sue has not a shoe. Shempeth (Shemp Howard): Then we will shoe Sue. For is Sue has no shoe, a-shoeing Sue we must do! Moeth (Moe Howard): Take this hammer and beat the shoe. Shempeth (Shemp Howard): Nay, I have not the heart to beat an innocent shoe! 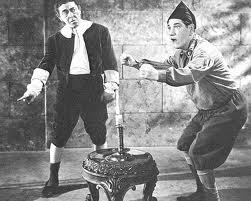 Moeth (Moe Howard): [having nailed a horseshoe to Shemp’s foot] Idiot! Thou hast made me shoe the wrong mule! Shempeth (Shemp Howard): Let me at ’em! I’ll tear ’em limb from limb! Moeth (Moe Howard): What’s holding you back? Shempeth (Shemp Howard): I got it! I got it! Shempeth (Shemp Howard): A terrific headache! Shempeth (Shemp Howard): Scrameth, princess, scrameth! Shempeth (Shemp Howard): Moeth! Larryeth! Get a plumber! I think I sprungeth a leak!